The original idea for an ongoing tweetchat for professional development came from Dr. Chrissi Nerantzi. The idea emerged through the success of the #BYOD4Lchat, a daily feature of the 5-day openly-licensed course Bring Your Own Devices for Learning (BYOD4L), first offered in January 2014 and based on flexible, distance and online learning (FDOL) Offered Monday to Friday from 8-9pm UK time #BYOD4Lchat always created a real buzz. Chrissi saw the potential for a tweetchat on its own, outside a course that would have the potential to develop a community around it. Courses have such a short lifespan, she thought. What about a community approach to professional development? If we want our academics engaged in ongoing professional development could a weekly tweetchat be an attractive option? Could it work? She wanted to give it a go! When the idea matured a little bit in her head, she shared it with Sue Beckingham over a Skype meeting and then with Dr. David Walker and Peter Reed in an email signing as Chrissi and Sue. She wanted the tweetchat to become a truly collaborative project from the outset and therefore creating the conditions for co-ownership were important to her. The Learning and Teaching in Higher Education tweetchat, or #LTHEchat, came to live. The name came from a core module Chrissi led while working at the University of Salford. Chrissi, Sue, David and Peter became the steering group and decided to run a 3-month pilot and see how it went. The first #LTHEchat was in 2014, on the 29th of October that year. Hundreds of tweetchats later, the tweetchat is still offered, growing and evolving. After a year of operation, rotating organising teams were introduced to share the workload and develop a participatory community where diversity, inclusivity and openness as well as organising responsibilities are shared among those who participate regularly and volunteer to help to create an offer that could potentially be sustained for some time. These teams work with great autonomy, each time supported in the background by a member of the steering group. There is an online form anybody can complete and express an interest to join a future organising team. What we hear again and again is that individuals would like to join an organising team to give something back to the community. This is truly heart-warming and we are very grateful for all individuals who have so far been members of the rotating organising teams. The #LTHEchat joined forces with the #HEAchat, the RAISE Network and communities that have come together to share, discuss and debate learning and teaching in higher education. The agenda is emerging organically by those invited or volunteering to be guest facilitators. This has included some students, but perhaps not enough. We had many guest facilitators and are grateful for their time, their expertise and engagement with the wider #LTHEchat community. We have been fortunate to have our very own #LTHEchat designer, Ellie Hannan, and our very own doodler, who draws all our pre-tweetchat drawings of the topics to be discussed, Simon Rae. Ellie and Simon have made the #LTHEchat recognisable and sprinkled artistic flair over it. Sue’s interest in social media for learning goes back to 2009 and led to a funded study visit to the US in early 2011, where she learned more about the use of Twitter in teaching and for CPD. As a regular participant in tweetchats such as #edchat, #SAchat and #hootchat, Sue had seen the potential for using Twitter to develop personal learning networks and create a forum for rich discussions. She introduced the idea of the tweetchat to BYOD4L in 2014 and also led with David Hopkins a guest tweetchat for Chrissi’s FDOL course and a guest webinar on Collaborative Learning and Communities in 2013. During BYOD4L the tweetchats took place each evening for one hour over 5 days and were themed by the 5C Framework. Six questions were composed relating to the theme of the day. The concept of posting questions at regular intervals with a shared hashtag enabled participants to give answers or ask further questions in response to these. By searching for the hashtag, all relevant tweets were pulled together and could be seen by all. Sue set up a Storify account to curate the tweets. After each chat the link to the ‘story’ could be shared on the blogpost. Taking this successful model forward for LTHEchat as with BYOD4L, a bespoke Twitter account was set up for @LTHEchat, the #LTHEchat hashtag was chosen and a new Storify account was created. These then linked back to the LTHEchat website created on WordPress, and the domain name LTHEchat.com was secured. A regular time slot was agreed as Wednesday 8pm. We felt this was important as we wanted people to easily remember the ‘same time same place’. Our initial plan was to ask the participants to vote for a topic to be discussed the following week. Chrissi and Sue led the first chat and then our first guest Dr Liz Bennett volunteered to lead a chat. From there on we reached out to our shared networks to find guests and before long volunteers came to us! Each provided a topic of their choice along with six questions. As facilitators we checked the questions for clarity and also for length to make sure they would fit within the 140 characters along with the Q1, Q2 etc and the hashtag. Quite a challenge! The pilot was extended and over the first year the steering group shared the ‘behind the scenes’ tasks. Chrissi then suggested we look to invite volunteers to form a rolling organising committee. This was a great opportunity to mentor others and for them to bring new ideas to LTHEchat. For example creating some ‘Hawksey magic’ (TAGSExplorer) visualisations of the tweets. 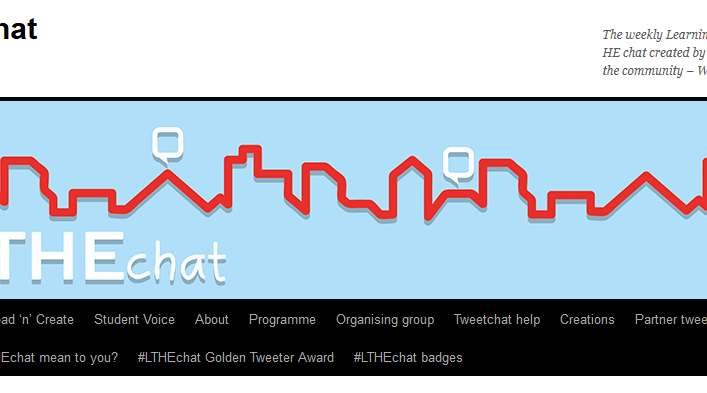 Fast forward and there have now been 21 amazing people help to make LTHEchat what it is today! These plus the amazing contributors to the chat have been the essential ingredients to make this project a success and sustainable. Most importantly it has provided a vibrant and supportive community of practice where everyone can continue to develop digital skills and learn about different aspects of learning and teaching. Jenny (Associate lecturer, 25 years’ teaching experience in HE): I started participating in the LTHEchat in 2015, cautiously at first, just reading and observing, and then gradually contributing. It soon became a weekly priority, to the extent that I felt very disappointed if my teaching schedule meant I couldn’t join in the live chat. I was hesitant at first about volunteering to go on the organising team, as it felt like a huge step up for me on the tech front, but I wanted to put something back into the community that had been so welcoming. I joined Scott and Rebecca on the Sept-Dec 2017 organising team, and it has been a great experience, with a lot of “firsts” for me – using WordPress for the blog, getting to grips with Storify, a group Skype, running the tweetchat…. and actually it wasn’t anything like as daunting as I expected. 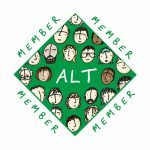 The community of the LTHEchat has given me the courage to take the leap, gain new experiences, get fresh ideas and try out new things. It’s an invigorating community of inspiring and supportive people. Scott (Associate Professor, 17 years’ teaching experience): My participation in the LTHEchat started in 2016, using that horribly phrase ‘lurking’ seeing what others were saying; but very quickly started contributing a bit. The community is supportive and so I felt I could contribute and have a critical discussion about something I am passionate about. It has become a fix point in my week, I look forward to. I was lucky to join a good organising team where everyone had a go at everything, friendly, taking the lead one week, supporting the others and the host on other weeks. Great experience and would recommend taking part in an organising team. 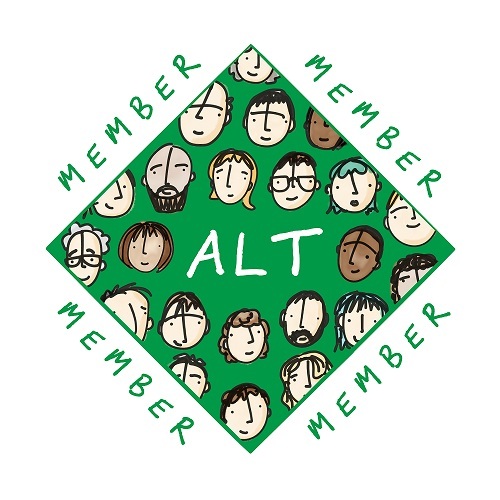 Rebecca (Learning Technologist, 5 years Staff development experience): My awareness of LTHEchat occurred as I was originally working in an isolated faculty position and was searching for a way to connect with a learning community. LTHEchat offered me a way to learn and connect with a wide and diverse community without feeling my lack of experience was a hindrance as everyone is treated equally regardless of role or experience. Joining the organising committee was scary but the team and Sue as our guide were supportive and encouraging throughout. We had different skills and experiences but the shared workload and the collaborative nature of the committee meant there was always someone to ask if you had a question or reassure you when something wasn’t going as planned. It was an invaluable experience that has led to new contacts and a greater understanding of the LTHE community and its value to the sector. Neil (Associate Dean, University of Salford): I have been an avid contributor to #LTHEChat from the very beginning as I was familiar with Chrissi and Sue’s work and was keen to take part in what promised to be a worthwhile and educational new venture. Twitter chats are a fun way to connect and discuss important topics and I found myself looking forward to Wednesday evenings. When the request came in to ask if I wanted to be part of the organising team (September to December 2015) I quickly jumped at the chance as I wanted to see what happened “behind the scenes”. I was very fortunate that there were a group of us and we could share out the “tasks” which were engaging and enjoyable, not really tasks as such but the chats don’t run without a bit of background work (blog, posting the questions, Storify). The whole experience of being part of the organising team was great fun and I learned some new skills – always a bonus. If you get the chance to join the organising team my advice is……..go for it! #LTHEchat a joyous and easy way to engage in friendly, energetic and enthusiastic dialogic PD. The one hour twitter storm inspires with its diversity, multidisciplinarity and humour. I love the always informed and provocative Q&A – and the sense that we are all welcome & valued. So far the #LTHEchat has attracted overwhelmingly practitioners from across the UK and only some from other parts of the world. And the vast majority of chats have been in English. We would love to explore ways to work closer with other communities from around the world and join-up. Tweetchats in different languages is something that would be of value and bring more diverse individuals and voices together. Furthermore, there is an opportunity to work more closer with students. Perhaps we should focus on this in 2018. We would love to hear from Student Unions and individual undergraduate, postgraduate and doctoral students who would like to engage. Finally, while there is plenty of anecdotal evidence that the #LTHEchat is of value, there is a need for a study to be conducted on the tweetchat so that we can make informed and evidence-based decisions for its future. Minor typo could you change the affliation of Scott Turner to University of Northampton instead of Leeds Beckett please. I have been looking for something like this for my master thesis. You mention the need for more research into the project. When will you do that and have you documented the anecdotes anywhere?